10 Amp 2400 Watt - Up to 300 slices. 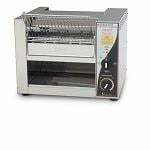 Ideal for toasting large volumes of bread, crumpets or muffins. Selectable heat source top or bottom or both together. Front entry, adjustable front return or pass through exit chute. Variable electronic conveyor speed control. Easy-clean crumb tray and reflector. Cover for speed controller switch.